Know TvTropes.org? As pointed out by XKCD, a great place to lose hours of time reading about SoBadIt’sHorrible, HighOctaneNightmareFuel and thousands of other tropes, all with examples from comics, films, tv-series etc. DFKI colleague Malte Kiesel has done the right thing and just released his linked open data wrapper for tvtropes, natuerally names dbTropes.org. Now go read about DiabolusExMachina, it will of course do content-negotiation so try it with your favourite RDF browser. Categories: Everything Else, Semantic Web. 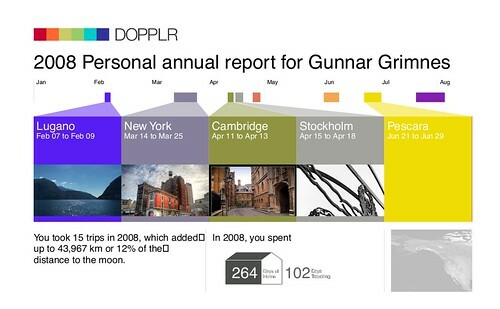 Kasei beat me to it, but Dopplr has released their yearly personalised travel reports. They are beautifully assembled PDFs with Flickr photos from selected locations and interesting facts. It reminds me of the Feltron report, but saves me going through the hassle of collecting this information for myself. I do like having personal data-sets available, and I often start collecting something, but quickly slack off and forget. […] A number of these phenomena have been bundled under the name "Software Engineering". As economics is known as "The Miserable Science", software engineering should be known as "The Doomed Discipline", doomed because it cannot even approach its goal since its goal is self-contradictory. Software engineering, of course, presents itself as another worthy cause, but that is eyewash: if you carefully read its literature and analyse what its devotees actually do, you will discover that software engineering has accepted as its charter "How to program if you cannot.". of the game Zing on OneMoreLevel.com. The game is nothing like I thought it was, I imagined the small things to be very abstract cars and not bugs trying to eat you. Oh well. controlled by the accelerometer of the FreeRunner, i.e. lie the FreeRunner flat, start the game, now when you tilt the FreeRunner in some direction the car drives that way! Trust me, the scrreenshot really does not do it justice, the feeling you get frome the immediate control and the amazing sound-effects is… well pretty much just like driving in real life! Download tarball, untar on FreeRunner, make sure you have python-pygame and libpng3 installed and run python car.py. Press AUX to exit. 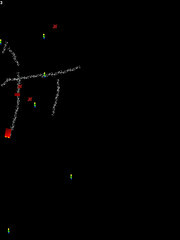 The code is of course not pretty, but does at least show some basics of Accelerometer handling. Categories: Everything Else, OpenMoko, Python. Anyway, the whole game summary is here. and 1379 pieces of gold, after 54466 moves. You were level 26 with a maximum of 211 hit points when you ascended. Only thing that makes me feel like I cheated is that I was lawful the whole game and changed to chaotic at the last turn to save me a meeting with pestilence. Next time I'll do it as a Wizard! I'm amazed how easy it was to drift away from the online world while I was in Norway, I had no nervous twitched about letting my unread email climb, not letting facebook notifications slip by or not checking flickr comments continuously. Previosly I've been using a long toolchain consisting of UFRAW, a cinepaint beta-build, qpfstmo and finally Gimp to process my HDR shots. Now finally someone has made a single program for doing both HDR bracketing and tone-mapping in linux! reply to this mail. Thanks. WTF? What do I make of this? Do I trust the anonymous person who identifies himself as Master Doofus? Do I break the holy rules of spam prevention and reply? And most importantly, where can I get my own lame perl script? On bias in public Wikis. Wikipedia is generally quite good at identifying and correcting bias and "non-encyclopaedic" behaviour in it's pages. In fact it goes so far that it's getting annoying at times when you are doing important research. A word of caution for Western men: Almost all Thai, Filipino and Indonesian women in Western bars and restaurants on Lockhart Road are prostitutes. They sometimes have a second job as 'waitresses'. Scams involving drugged drinks, inflated bills, and once more personal info is exchanged, blackmailing the men, a sick mother back home in the Philippines needing an urgent, expensive, life-saving surgery, etc. are very common. Don't fall in love with them, only to be ruined economically and personally by them. Do I sense a slight note of personal bitterness?